The national headquarters of Lambda Chi Alpha suspended the Butler chapter of the fraternity effective immediately until spring 2021. The fraternity’s national board of directors had a conduct review on Jan. 10 and then voted to close the chapter, according to documents obtained from Lambda headquarters. “An action like this doesn’t come lightly,” the document reads before stating the decision for closure comes from repeated disciplinary issues by the chapter. The chapter members were told Monday night at 6 p.m. in a meeting with representatives from their national headquarters, alumni association, housing board and Butler. Trent Craig, who was president before the suspension, was told 15 minutes before the rest of the chapter. Lambda headquarters received a letter on Jan. 3 that included details of six incidents that occurred in the fall semester, which sparked the fraternity’s conduct review. 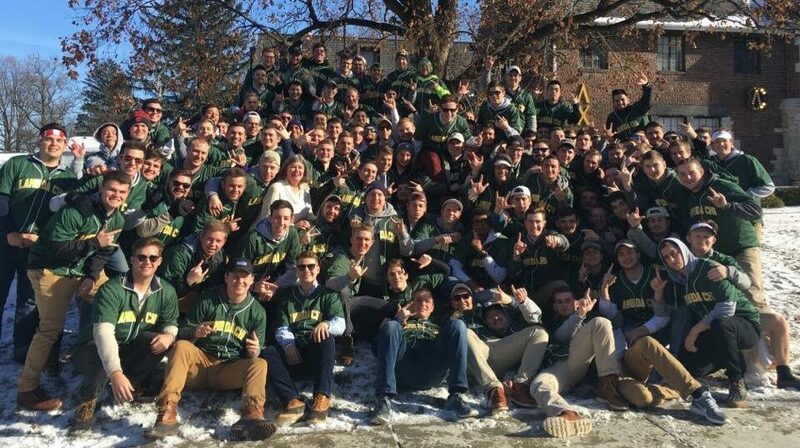 A letter from Lambda headquarters to the members’ parents described the incidents as “one in which a student was taken to the hospital, two at which students had been arrested, and three at which alcohol was present in violation of the Chapter’s probationary status,” but did not elaborate any further. Tad Lichtenauer, Lambda Chi Alpha’s national communications director, said the chapter’s probation has a zero tolerance clause. Lichtenauer said the decision was made by both the national fraternity and the university. Anne Flaherty, interim vice president for student affairs, said Butler did not play a role in the actual process. Lichtenauer said Butler might have taken this course of action even without the board. The closure of the chapter also means the closure of the house, which is privately owned by the fraternity’s housing corporation. In an email to the Collegian, Associate Director of Residence Life Doug Howell said alternative housing options will be found for the chapter members by Friday afternoon at the latest. The housing corporation told the members they must move out by Saturday at 5 p.m., but there might be another date for members to move out larger items like mattresses. Lambda’s housing corporation will continue to own the house, and the headquarters have no plans for the building at the moment, Lichtenauer said. Craig, who has to move out, said the physical transition is the most upsetting. He said he thinks the move will disband the members who are used to living together all the time from eating dinner and watching sports. Craig said the change will be particularly hard for the 39 new members who were only in the organization for a week. Lichtenauer said they are free to join another fraternity, depending on recruitment processes on campus. However, now there are only four chapters left on campus, which is one of Flaherty’s main concerns. “Even before Lambda closed, we were already worried about [the lack of spots in fraternities] and now this has compounded it and increased our urgency,” she said. Flaherty said she thinks Butler’s overall Greek life presence is positive. Every fraternity on this campus was suspended at one time except Sigma Chi, and three of them have returned to campus. Tau Kappa Epsilon and Phi Kappa Psi are still closed. Last year, a committee to find another fraternity for Butler’s campus started the bidding process and found finalists. The process was paused for larger campus planning projects, but Flaherty said it will begin again next month. Both the university and fraternity representatives said they are hopeful and excited about bringing the chapter back to campus in 2021. The Collegian will continue to investigate the incidents, the timeline and a potential new fraternity on campus in the upcoming semester. Would have been nice if the National Organization and or the University notified the alumni once the chapter was put on probation. Hi Bob! Tim Vassar here. I had no idea our house was on probation either. Look me up and we’ll reconnect. It should be noted that all but two of the allegations were found not to be the chapter’s fault, including the student who was sent to the hospital. Those which stood involved underage students being offered alcohol at the house. How is it that a few are getting the whole frat judged?Why not judge the guilty rather than the entire fraternity?This makes no sense! !Even so why wasn’t this judgement handed down by the national before 2nd semester started.Its rediculous to let 39 new members move in & tell them 8 days later they have to move out!!! Cold hearted & unfair decision on nationals part,makes me sick!! The whole group was on probation for fall semester as far as I can tell, so they were supposed to be on best behavior. Apparently they were not. When everyone wears the same letters, everyone is a part of the group and everyone represents. HQ doesn’t play games with risk management. They haven’t for decades. I am a mother of a displaced member. I didnt get any letters indicating anything as stated above. I certainly get the bills though. I still say that if this was the decision made by national it should have been made at the end of a semester & the fraternity shouldn’t have been allowed to recruit new members for the second semester.Why let all these guys move in and then tell them 8 days later they have to move! It’s a bad decision that will reflect on butler even though they say they had no part in it!! My son an “independent innocent” has been displaced from his room at UT to a pig sty of a room with an equally inconvenienced roommate. It’s a “not so funny” version of “Revenge of the Nerds” in reality. My son an independent student is suffering the ripple affects of the situation. Parent of displaced Junior. My son is a mid-term Junior and was under the impression the probation was over by Thanksgiving. Regardless of that, why didn’t National let the students know of the violations prior the fall semester ending. I also question 2 people being offered liquor, was it an individual at the house who offered and should have been accountable. Overal being a pet of this fraternity has changed my son for the better, I only hope it doesn’t taint his future outlook on the remainder of his education. It is sad to see this happened, as an alumnus, I remember this frat being one of the more disciplined houses on campus. Jeff Tuttle has a fair and valid point. One other perspective is to ask why a house on such thin ice was permitted to recruit new members? That would be a rough reality given cycles of college life. Yet, closing the chapter and having all the new recruits’ heads spinning is rough, too. Relative of a devastated pledge. #David G. Plummer, #Jeff Tuttle…I agree. Why permit chapter to recruit new members? My concern is the effect it will have on the members as it relates to retention, grades, etc.. The way in which this all went down doesn’t do much for fostering community involvement. It is my hope that there is a class action lawsuit against butler/ lambs chi whoever is the true instigator of this closure(it is a great candidate for a lawsuit the way it was handled). I hope that in the future that more concern is given to the young men living in these houses, and that never again is one closed a week into the new semester like this one was!! I was there Saturday till 4:30 & talked many members and parents.Incredibly sad!! That sentence told me that these incidents had not been brought to the attention of the headquarters until they received this letter. Maybe that’s not correct, but that’s what I read in this article and others. I have had experience with Lambda Chi closing and/or reorganizing chapters. They make every effort to do that at the end of a term. If they just got these reports on January 3rd, they’d have to be verified. The timing is, of course, unpleasant – but there must be something percolating there that made immediate closure of the chapter at the beginning of the semester warranted. They had, after all, been on probation for two semesters already. I don’t know about suspending recruitment during a probationary period – do fraternities do that? Isn’t that almost assuring the chapter will never recover? It doesn’t make sense to me. My bigger concern is that they will now sell the property out from under the fraternity to accommodate the new shops and buildings the university is building. Is this a coincidence?? No coincidence,a source told me that the university was negotiating the purchase of the property last April/May but negotiations stalled! I am very interested on how this may lay happened . I will Not assume or open my mouth till i get a response at someone’s convenience.